Origins - Fennel originated in the Mediterranean. The plant's popularity spread northward during the middle ages, when it was grown in monastries. It is now naturalised in many parts of the world. Description - Fennel grows erect with a thick root and stout stems. It can grow to 4 - 5 feet or more in height. The leaves grow to 40 cm long and are finely dissected into fronds. The bright golden flowers, produced in large, flat terminal umbels, with from thirteen to twenty rays, are in bloom in July and August. Attributed medicinal qualities - A tea made with a few fresh sprigs of fennel or a level teaspoon of seeds will relieve indigestion. An infusion of the seeds is an excellent carminative, especially for babies. Use 1 teaspoon (5ml) of infusion for colic and gas. An infusion is said to make a soothing eyewash. Fennel is an effective treatment for respiratory congestion and is a common ingredient in cough remedies. An essential oil is often extracted from the seed for medicinal use, though it should not be given to pregnant women. Fennel tea, formerly also employed as a carminative, is made by pouring half a pint of boiling water on a teaspoonful of bruised Fennel seeds. This is said to also help stimulate the flow of breast milk. It is sometimes added to baby formula to aid digestion. History - Ancients believed fennel seed was particularly helpful for improving eyesight. In ancient Greece Fennel was known as Marathon (because it grew at this battle site), and it was used as a symbol of victory. Fennel was used by the Greeks as an effective slimming agent, they also believed it gave courage and prolonged life. Greek athletes would eat it in the hopes it would improve their performance. Greek herbalists would prescribe it as a remody for poor memory. The Romans called it foeniculum , meaning fragrant hay. The Roman name was corrupted in the Middle Ages into Fanculum , and this gave birth to its alternative popular name, 'fenkel.' In this time it was often eaten to relieve hunger pangs on fast days. Culpeper believed that the seed was effective against bites, stings and poisons. It was frequently mentioned in Anglo-Saxon cookery and medical recipes prior to the Norman Conquest. Fennel shoots, fennel water, and fennel seeds are all mentioned in an ancient record of Spanish agriculture dating A.D. 961. In the far east it was valued as a condiment and digestive aid. In mediaeval times, it was employed, together with St. John's Wort and other herbs, as a preventative of witchcraft and other evil influences. People would hang it over their doors on Midsummer's Eve to ward off evil spirits. It was also eaten as a condiment with salted fish , which was commonly eaten during Lent. It spread to India, the Orient, Australia, South America and the US. In America It was called the “meeting seed” by Puritans who would chew it during their long church services. Cultivation - Fennel is a hardy, perennial, it grows wild in most parts of temperate Europe. It will grow in most any soil, but the richer the soil, the more tender the foliage and the less aromatic the seed. It likes a well-dreained, sheltered but sunny position. It is easily propagated by seeds, which should be sown directly in the garden in the late spring. Seedlings do not transplant well, os it is better to plant them 10 - 12" apart and then thin them out as necessary. It grows a very deep taproot which is difficult to pull up, so remove unwanted seedlings while young. The plant will self-sow generously. To maintain a continuous supply of fresh leaves throughout the season, sow a few seeds every 10 days. If seeds are not desired, remove flowerheads to promote bushier growth. Fennel can be grown as an annual, although the established roots will overwinter easily. For even more plants you can divide the roots in autumn after the seeds have been harvested. To keep the plants healthy it should be replanted every three to four years. The flowers attract bees and hoverflies. However, many other plants dislike fennel and grow poorly when forced to share space with this strong herb especially beans, tomatoes and kohl rabi. Never plant fennel near carrots, coriander or dill as they may cross-pollinate. Harvesting, preparation and storage - Fennel leaves will keep in a plastic bag in the fridge for 2-3 days. The stalks can be used fresh or tied in bundles and hung up to dry. Once the stems reach full size the seeds appear after a few weeks. They can generally be harvested around the end of August. The yield may be low in the first year but should increase in the second. Loosely secure a permeable bag (cheesecloth or muslin) around each flower head to collect any premature seed releases. When a plant is ready (the seeds will have started to turn brown) cut the plant. Hang the cut plants in a warm dry place over a cloth; when they are thoroughly dry, dump them into a bag (which you will later use for threshing them). When your crop is fully harvested, thresh the lot: beat the bag in which you have collected them against a hard surface to dislodge the seeds. Sift the loose seeds through a 3-inch mesh hardware cloth to remove the chaff. Make sure the seeds are thoroughly dried before putting them away for storage (in the usual manner for dried herbs and spices: an airtight container stored in a cool, dark place. They will keep for 2 - 3 years. 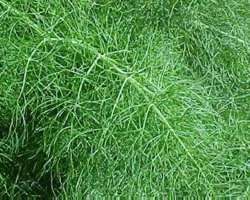 Culinary Uses - Fennel has a sweet aroma and an aniseed flavour. The leaves and stalks of fennel can be eaten as a vegetable. Italian breeds with fleshy stem and leaves to be used as a vegetable are often referred to as “Florence Fennel” or “Finocchio” in English, but the name finocchio may mean any type of fennel in Italian. You can use the leaves to great effect with pork, veal and fish. They are also good in fish stock, sauces and stuffings, and in mayonnaise, flavoured butters and salad dressings. The dried stalks can be placed under grilled or barbecued fish. At the two-leafed stage, the seedlings make a pungent addition to salads, reminiscent of mustard. The stronger tasting fennel seeds have a flavour more like aniseed or liquorice. In Europe it is widely used as a flavour for fish, bread and confectionary. They can be used as a spice, particularly in cakes, breads and stuffings. In Iraq the seeds are ground and combined with nigella to flavour bread. The root when cooked is similar in taste to parsnip. In Italy, there is also small-scale usage of fennel pollen (a golde-green colour) as an expensive and rather extravagant spice. Also known as “Spice of the Angels”. The pollen has a faint, spicy fennel scent that best complements fruity flavours. It should be added late in the cooking process, or even just before serving. When hung over a door, Fennel is also believed to repel witches. Other Uses - People often chew the seeds to freshen their breath and it is sometimes an ingredient in commercial "natural" toothpastes. It is one of the plants which is said to be disliked by fleas, and powdered Fennel has the effect of driving away fleas from kennels and stables. Yellow and brown dyes can be obtained from the flowers and leaves combined. It is a main component of the Chinese five spice powder and is often an ingredient in the Provençal spice mixture Herbes de Provence . The essential oil and the oleoresin of fennel are used in condiments, soaps, creams, perfumes, and liqueurs. It can be effective against flatulence. Pour a cup of boiling water onto l-2 teaspoonfuls of slightly crushed seeds and leave to infuse for l0 minutes. This should be drunk three times a day. To ease flatulence, take a cup half an hour before meals. Culpeper: ". . . the seed boiled in wine and drunk, is good for those that are biten with serpents, or have eat poisonfull herbs or mushrooms." Bentley, Robert and Henry Trimen (1880): "Fennel fruits are aromatic, stimulant, and carminative, resembling, in these particulars the fruits of anise, caraway, and dill. They are rarely used in substance, but more commonly in the form of the distilled water and the volatile oil. Fennel water is alone official in the British Pharmacopoeia and the Pharmacopoeia of India: it is a useful remedy to relieve flatulence, and as a pleasant adjunct to other medicines to prevent griping, etc." Coles (1650): "both the seeds, leaves and root of ourGarden Fennel are much used in drinks and broths for those that are grown fat, to abate their unwieldiness and cause them to grow more gaunt and lank." Parkinson (1640): "The leaves, seede and rootes are both for meate and medicine; the Italians especially doe much delight in the use thereof, and therefore transplant and whiten it, to make it more tender to please the taste, which being sweete and somewhat hot helpeth to digest the crude qualitie of fish and other viscous meats. We use it to lay upon fish or to boyle it therewith and with divers other things, as also the seeds in bread and other things." Pliny: ". . . serpents eat it 'when they cast their old skins, and they sharpen their sight with the juice by rubbing against the plant." Mattiolus: "In warm climates, the stems are cut and there exudes a resinous liquid, which is collected under the name of Fennel Gum." Milton, in Paradise Lostt: "A savoury odour blown, Grateful to appetite, more pleased my sense Than smell of sweetest Fennel." Longfellow: "Above the lower plants it towers, The Fennel with its yellow flowers; And in an earlier age than ours Was gifted with the wondrous powers Lost vision to restore."